Day four of our brotherly Scotland trip 2014 would finally see us visit our first (open) distillery, Auchentoshan. A first for Peter the wee one of us. If you’re in Glasgow and you want to visit the distillery, follow the following advice we received from locals (namely Pete and Andy from Inverarity 121): Forget taxis or buses or whatever – take the train! The local train service from Glasgow’s Queen Street station takes you to a station in the middle of nowhere called Kilpatrick. Take a left hand turn at the intersection of the footpath until you reach the motorway and then proceed for a few hundred metres back towards Glasgow. 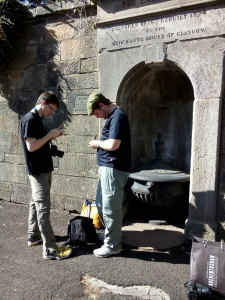 Soon you will see the sign “Auchentoshan” and you’re there. Simple, quick and cost-effective. You always end up meeting nice people in trains, too. We met a charming Australian girl, Emily, who was on a trip through Europe for a few months. She didn’t want to join us for the distillery tour, though. Her loss, I guess. The distillery is very beautiful and in great shape. Perfectly white buildings, flowers everywhere, perfectly cut lawn, clean, bright, welcoming buildings – they really do care about looks as much as they do about their whisky. We took a standard tour and got really lucky. The group was really small and our young tour guide Rosie was fun and engaging. Sadly the distillery was in silent season so we didn’t see it in production. A great bonus was getting the chance of tasting the new make spirit, not many distilleries let you do that. Even though it was clocking in at 81% ABV I found it very rounded, sweet and – due to the triple distillation – cleaner than others I’ve tried so far. They’re so proud of their new make, they even sell it in their shop in a set of three 5cl bottles containing new make as well as one- and two-year old spirit. At the end of the tour we got to taste a dram or two or three. Honestly, I don’t remember what we tasted but I didn’t find any of them to warrant proper tasting notes. Nice drams but I guess none were impressive enough to remember now, three months later. What I do remember is the wee sample I got from their bottle your own cask as it was good enough to make me fill a (wee) bottle myself. 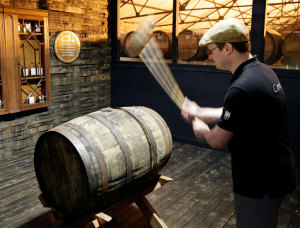 Bonus points to Auchentoshan: Their fill your own bottle experience is awesome! They lead you into a designated area in the warehouse where they keep the cask. You have to remove the bung yourself, remove the liquid with a valinch and then fill the bottle. Most other distilleries only have a cask in their visitor’s centre with some kind of valve installed. 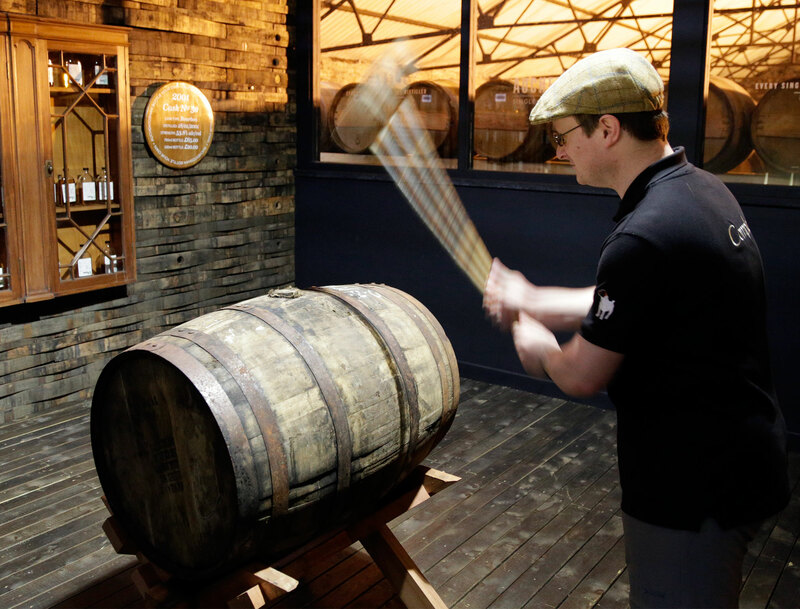 Far more intense experience the Auchentoshan way! Anyone who’s ever been to the Isle of Arran will most likely be in love with it. It all starts with a tasty brew from the Arran Brewery on the ferry over from Ardrossan to Brodick. Arran has everything it needs: A brewery, a creamery, a bakery, a butcher, a cheese factory and so on and so forth. It really is lucky in this regard. Oh, and there’s a distillery too, a fine one at that! 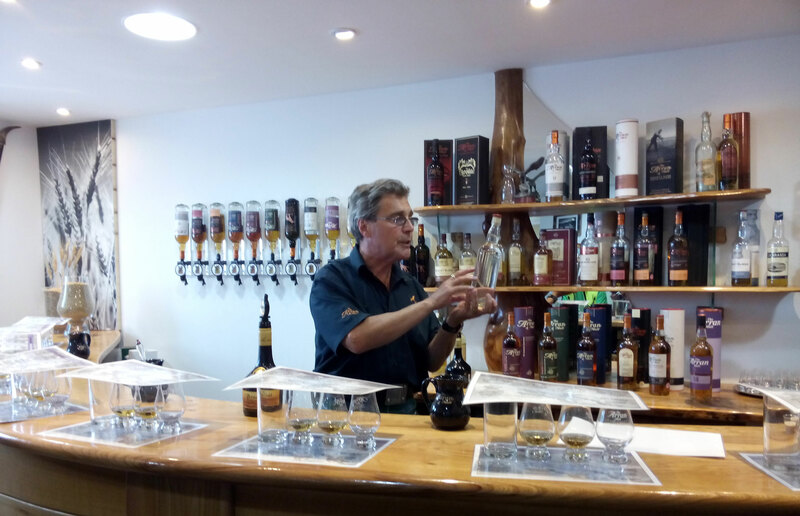 To reach the distillery you have to leave the main settlements of Brodick and Lamlash and head to the charming little town called Lochranza at the northern tip of the island which is exactly what we did. If you don’t have a car this means roughly an hour’s ride on bumpy roads in a coach. One very handy fact: Nobody really cares about bus stops on Arran. Just thumb the driver, hop on and tell him where you want to get out. Our stop was at the youth hostel in Lochranza. Recently renovated it comes highly recommended not only to travellers on a budget. We didn’t lose much time there and instead walked down the road again to hop on a tour at the distillery. 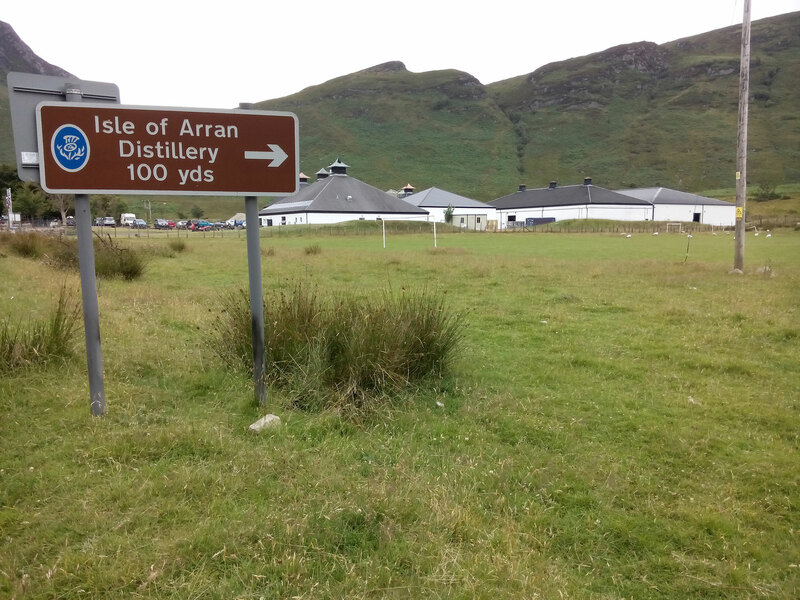 So, here’s the deal: We initially weren’t sure whether we wanted to do the tasting tour at Arran distillery again. The reason being that I was there in 2013 with my middle brother and we weren’t very impressed. It was, in fact, our lowlight of all whisky tours in 2013. The tasting at the end was rushed and the tour guide was eager to get us out the door. Not cool. This time round things were WAY better and we were glad we returned and gave Arran a second chance! We even learned that this particular guide from last year was no longer working there. But first things first: Lunch! The distillery has a very nice cafe in the visitor centre where I enjoyed an Arran lamb burger (yum!). And then it was time for the tour. Once again a rather small group, just us and a group of Swedish cyclists, we had a very relaxed and fun tour with our guide Richard (shout out to him!). The tour starts with a nice video (which you can view on Youtube, too) and a dram of the 14-year-old. Yes, not the entry-level NAS bottling you get in most other places – very nice detail there! 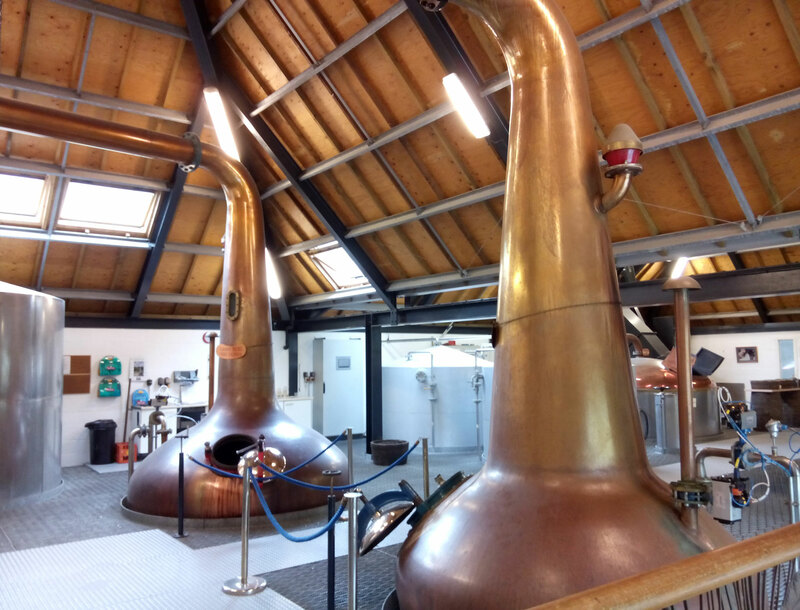 My notes from the tour are sadly the worst of all distillery visits this year, so no technical details this time around (I guess I need a reason to visit a third time…). What I did write down was them going through 30-40 tonnes of barley every 7-10 days resulting in about 500.000 litres of spirit per year with one small run of peated malt which they sell as Machrie Moor. 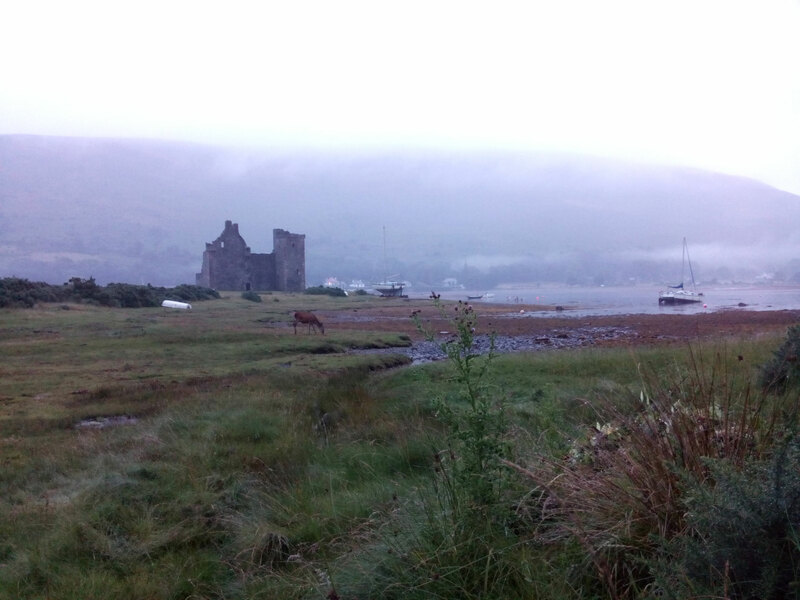 Dinner in front of the Youth Hostel in Lochranza. 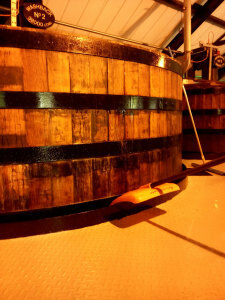 The stillhouse is arranged in a very efficient way. 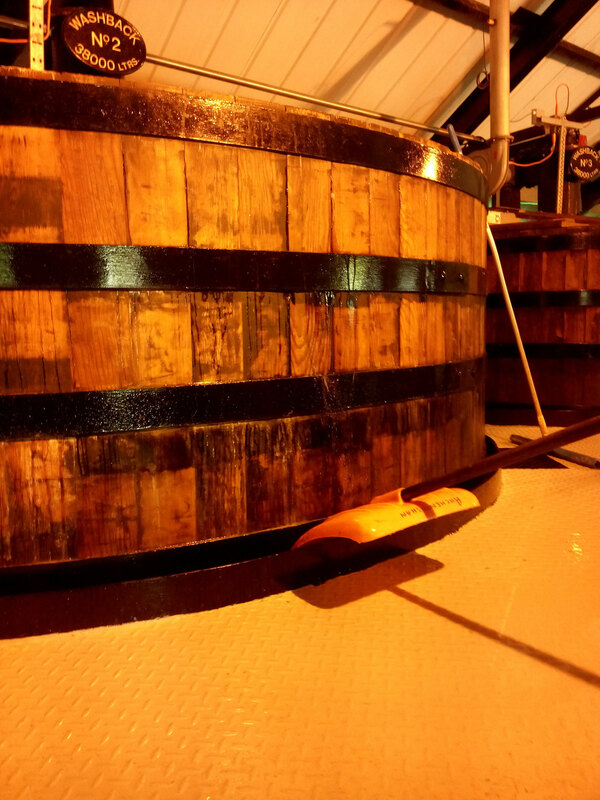 Just one mid-sized building where everything is done on one floor – milling, mashing, fermenting, distilling. You do not get to visit the warehouses on the standard tours which is the only downside, really. When done touring the premises you end up at the tasting room where you’re presented with a range of expressions (depending on what you’ve paid for, we got the 10yo and 12yo cask strength) and you can choose your last dram from the extensive selection. The third dram for me was this year’s festival bottling. Sorry, no tasting notes either, but it was really good. Trust me. All in all I really enjoyed this year’s tour – it was such a huge improvement over last year! Richard was very fun, engaging, knowledgeable and patient, we had all the time we needed to thoroughly enjoy our malts. Cheers, mate! After our distillery tour (and buying some malts including the superb bottle your own…) we wanted to pay the butcher’s a visit to buy something for dinner but, alas, the store was closed. Thankfully the sandwich station at the next corner was open and so we didn’t have to stay hungry much longer. 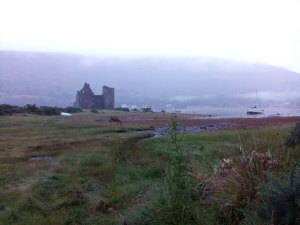 If you’re in Lochranza, go visit them! Best sandwiches in Scotland! By chance we also ran into an English chap with his charming daughter Maria who also stayed at the hostel. Instant friendship right there! After a walk on the beach and visiting the castle it was time for dinner outside in the youth hostel’s garden. 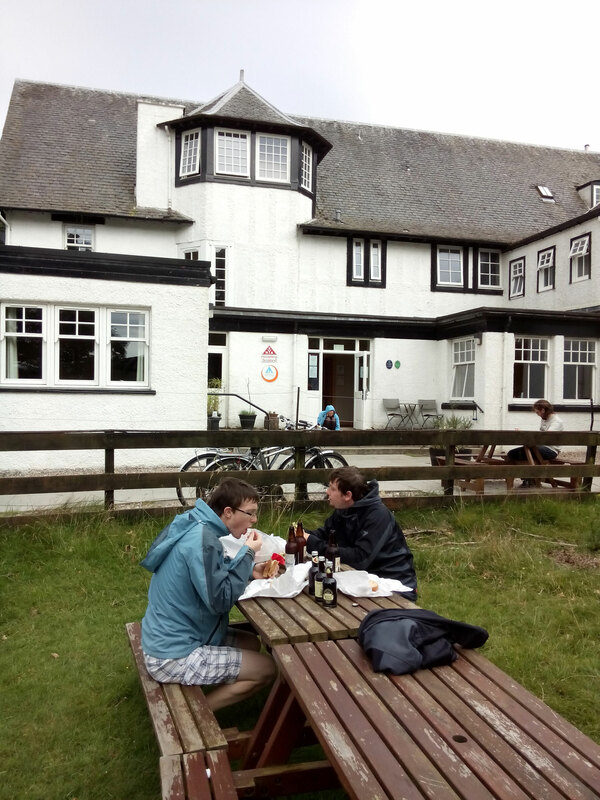 Never pass up a chance to enjoy moderately good Scottish weather outside… Since there’s not much to do in Lochranza in the evenings and we didn’t feel like visiting the pub we stayed inside the hostel where we ran into Maria once again in the common room. Not having gone to the pub turned out to having been the right decision – the four of us had lots of fun chatting and playing games (and annoying people sleeping above us… ooopsie…). Day six of our trip was a “day off” – completely unplanned and unscripted. That’s one of our recommendations if you’re planning to do a trip like ours: Don’t plan each and every day in advance, leave a few days free with nothing on the agenda! We didn’t end up doing much in the end, but this was due to the Scottish weather finally catching us – rain, rain and more rain. Instead of going hiking as we thought we might end up doing we just took the bus down to Brodick to stroll around the village, do some shopping and sightseeing. Sadly the brewery was not in production, I would’ve loved to have a peek at their setup and a chat with the chaps. But we did end up with a fun encounter at the chocolate maker’s store, where the sales lady also works as a dentist’s assistant. Oh, and she’s from Austria, too! …this calls for a dram. Or two. That evening we did end up at the Lochranza hotel for dinner (haggis, neeps ‘n tatties for me) and a few pints and drams. That bar really has a nice range and selection of malts, affordable too. 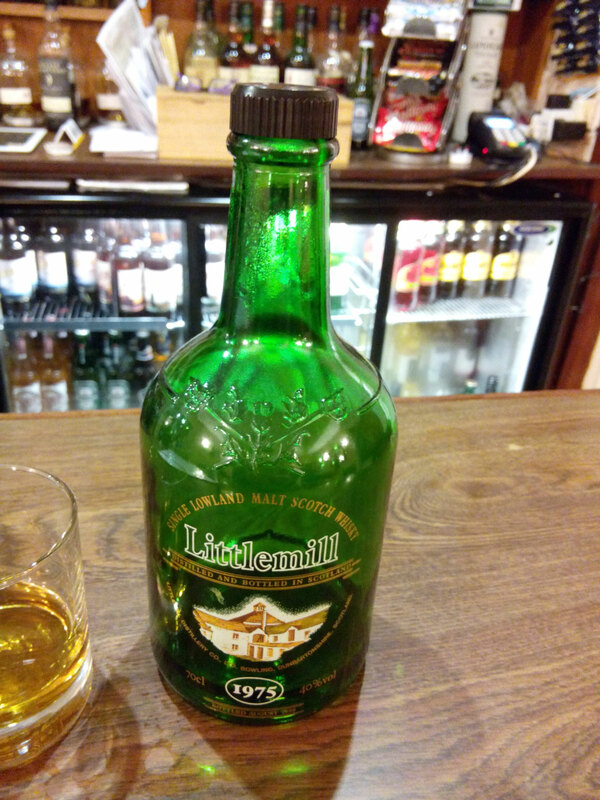 Highlights of the evening were a 1975 Littlemill (as pictured) and a 1974 Glencadam G&M bottling. Sorry, no tasting notes as the glasses were somewhat inappropriate (Glencairns were out…). Oh well. Back at the hostel another evening of fun and games ensued. For a moment I felt young again (cough, cough…). Just two days on Arran was a wee bit short in hindsight, but we couldn’t fit it in any other way – and we will be back. Definitely!